Serving Chicago and Suburban Bands, Musicians and Sound Techs for over 50 years! 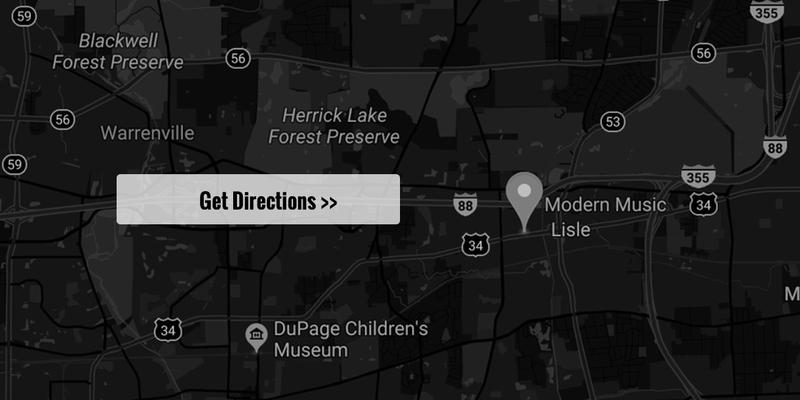 Modern Music is a retail musical instrument store located in the west suburbs of Chicago. We buy, sell, trade and offer consignments on new & used Guitars, Amplifiers, Loudspeakers, Mixers, Brass and Woodwind Instruments. Our other services included Lessons, Instrument, Amplifier and Pro Audio Repairs as well as our infamous Rental department in which we supply Musicians, D.J's Sound Companies and Party's with Sound Systems, Instruments and Percussion. Modern Music is and will forever be an independant shop full of professional musicians, teachers and engineers. Our staff dedicates a lot of our personal time outside the shop to playing and evaluating equipment in the real world. Sometimes one on us is performing right down the street, a couple of employees are often on tour and sometimes even on other continents! With all of our well knowledged employees being performers, teachers and engineers you can assure that we know that the stuff we're selling is up to our high standards. Our website is here to help you find the gear you need as well as let people know when we find a product that just knocks our socks off. Always feel free to contact us today with any questions about equipment, lesson schedules, rentals and/or repairs.